Do they need to take math all four years? What’ll look good on their college application? What if they want to be an engineer? What if they want to be an artist? I know, I know. Maybe your kid is hoping to skip math your sophomore year so they can take two electives. Or they want an easier senior year, and you’re trying to check math off their course list. But Collegeboard and the National Association for College Admission Counseling (NACAC) say otherwise. Well, aside from the college admission benefits your child will get from having a full, four-year schedule of math, they’ll also get academic benefits. In fact, students who take math all four years are way more successful in college than students who only took three years. Still need some convincing? Okay, I’ll bring out the big guns. The fancy-dancy Yale admissions officers note that if your child is looking to get into an Ivy League School (they note Yale specifically, but you can read it as just about any competitive school)…they can’t take an easier schedule senior year. So. Now that I’ve convinced you that your student needs to take math classes all four years of high school, you might be rolling your eyes. Their best bet is to take at least four of the following six classes, taken in the order shown below. Why this particular order? Well, the classes at the top of the list help build important skills your child will need for classes lower down on the list. But does your child need to take calculus? What if they only make it up to Trig? Well…they’ll probably be okay for a regular college. But if they’re looking to get a really great education at a selective school, your student should really aim for Calculus. Okay–so maybe your kid isn’t even thinking about highly selective schools. But what if they change their mind junior year, and they’ve just finished Geometry, and Calculus looks out of reach? The best plan of action is to take as much math as possible, so they can keep those doors open. What’s a good way to fit all these classes in? Start Algebra in the 8th grade. 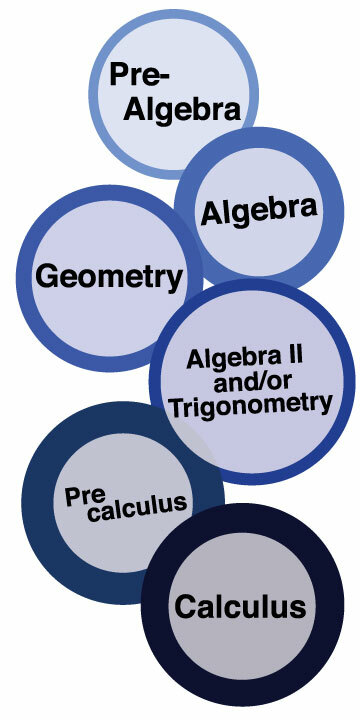 Sometimes, high schools also let students take Geometry/Algebra or Geometry/Algebra II as a package. AND, of course, there’s always summer school and community college. So there you are! You know why your student should take math all four years, and you know they need to aim for calculus. But what if they love math? Let’s say your student is dying to go to MIT and get an engineering degree. They’ve got MIT posters on your wall, and they’re president of the engineering club at their school, and took first place in the robotics competition last year. Go them! That’s amazing and impressive…and your student can differentiate him or herself even more by taking more math classes. If your child is already interested in engineering or science, they’ve probably already been a little bit ahead in their math classes, and might even finish Calculus their junior year. Or, let’s look at the other side of the coin. Maybe they love math…but their school doesn’t have Advanced Placement (AP) classes. Or maybe their school offers an International Baccalaureate (IB) program instead. Or maybe they only have one math teacher, and that teacher certainly doesn’t offer a class on Statistics. Are your student’s dreams of going to an elite university totally sunk? Long story short: for the best chance of getting into an elite university, make sure your student takes full advantage of the math opportunities that their school offers! Take math all four years! If possible, have them start Algebra early, and take Calculus their junior or senior year. If they want to pursue a math or science degree, encourage them to take a more advanced math class senior year. If their school doesn’t offer advanced classes, just make sure they excel in the classes that are offered. Keep that in mind, and your student is so much closer to attending the college of their dreams! Which colleges is your high schooler dreaming about? Let us know in the comments! This is a really great post and really useful information to know about! How many math’s are there in Math ? Nice blog, helpful for students to know about the math classes. Thanks! I’ll check out the resources you offered, and call in!